The Ensiferi in Latin literally means "who carried a sword". It was an adjective, first coined by Lucanus in the 1st Century BC but applied to the early republican era of Rome and in general Italic infantry. It could be argues that at some point after Camillian reforms the adjective became meaningless as the three main Roman Infantry ranks had all a sword. The term however don't tells the nature and shape of the sword in question. For good reasons. Contrary to common opinion, the Roman infantry did not came out with the famous Gladius, right from the beginning. The latter was, like most of the Roman gear, a foreign adoption. It was inspired by the typical Iberian straight sword and was called for this reason, after its adoption around the time of the second Punic war, probably by Scipione (future "Africanus", winner of Hannibal) and therefore called at the beginning "Gladius Hispaniensis". It was remarkably shorter than the straight, common sword used by the Italic peoples and known as the spatha. The latter was much longer than a gladius, but still shorter than the late Spatha, as carried by the "Spatharii", a late melee Roman cavalry type and soon in widespread use during the so-called "dark age" of the barbarian invasions. The infantry type known as Ensiferi Italici was the basic non-spearman type in use by both the Samnite, Etruscans, and other Italic peoples, especially during the VI-IVth centuries eras which saw Rome emerging from the state of a small backwater to a raising regional power. After 299 BC and the defeat of the last remnants of the Samnite power, Rome has secured indeed a very large foothold in central Italy, still with rebellious Etruscans in the North-west, Gauls in the North-east, and Greeks in the south. By that time, Rome could already count on a comfortable supply of "Socii Latini", its Latin allies. Report made by Latin -or greek- authors about the composition of their armies is all but unknown. We can only made suppositions about the level of imitation these regional troops made of the Roman army types. We do known these troops had elites within called the "extraordinarii" -both cavalry and infantry types- placed under direct orders of a consul, and these picked-up troops carried some extra edge or specialty to the Roman legion. A highly skilled, heavy cavalry (like the reputed Campanian cavalry) for example whih compensated for the lack of good cavalry within the Roman Army, of some kind of swordsmen, heavy skirmisher infantry, or specialized spearmen, hoplite-like. With time and the global influence of Rome and better integration into the legion, we can imagine this infantry similar to the Hastati/Principe style. 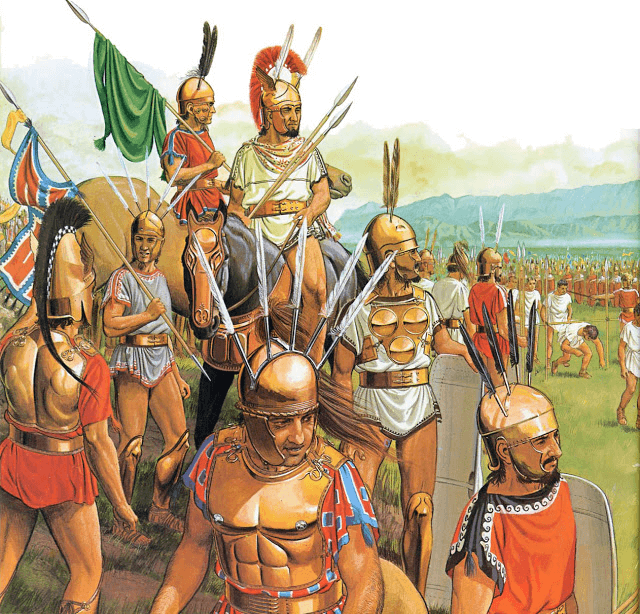 The Etruscans and Tuscans as described by Livy counted on upper-class soldiers on one side, either heavy spearmen like the Hoplite Primore, modelled after the city-state Greek hoplite, and lighter spearmen (Lancearii), mostly use for defensive purposed and backed by hundreds of Lancearii delecti, or peasant levies spearmen militia. The elite attack infantry was called the Ensiferii and was armed with armor, aspis-like shield, two heavy javelins or "pila" and a sword, generally of the Greek curved style, or "kopis". Similar to the Spanish falcata, the kopis is perhaps derived from the Khopesh, the archetypal Egyptian weapon that was made to inflict the maximal blunt force possible. Less crude than the peasant hammers, maces and axes, these were refined weapons with a curved blade and long handle able to cut through armor but also to stab with the edgy forward part of the curve; The greek version tended more towards the straight sword, with a slightly curved blade, angled on the back, and rounded on the other, cutting side, with a distinctive curve and specific handle with a decorated, often horsehead shaped hand guard. The weapon appeared in the 5th century BC and meant "Chopper". It was less widespread than the cheaper straight xiphos, and was adopted first by cavalry and superseded by the longer makhaira ("chopper") as the infantry type was made gradually shorter. The Makhaira was also curved, but of simpler construction and although still one-edged, it kept some of the weight particulars of the previous weapon as being heavier in the front for balance. It was also largely used by the infantry but was notably heavier and larger than the Xiphos. Indeed early examples of the Kopis were about 65 cm long, like a regular spatha. It had both the reach and a much better blunt force than the spatha due to its recurved design, combining the strength of both the sword and axe. The Nepalese Kukhri of the famous Gurkha, employed by the British Army was perhaps modelled in ancient times on the Macedonian Kopis when Alexander's army crossed their lands, just as the Afghans adopted the distinctive Macedonian soft cap. This kopis was also a heavy knife used as a tool for cutting meat for ritual slaughter and animal sacrifice. Etruscan warriors, well protected and probably picked-up, using the Kopis combined with pila were the perfect assault infantry. In fact such swords have been found as early as the 7th century BC in Etruria, and due to its Greek-oriented culture could have been the creator of this weapon, later adopted by the Greeks. These Etruscan and Tuscan Ensiferi could have used either the common Chalcidian helmet, the Italo Attic model, which had some similarities with the Phrygian model and ofter decorated with metal wings, crests and the usual adornments, horsehair plumes and crests, and feathers. Apparently the Montefortino type was used, wether it was an adoption of the nearby Gauls, or a local version of the Greek Pilos (possibly misinterpreted as such) and the closely resembling Neagau type. Ceremony that follows the Roman defeat in 321 BC in the hands of the Samnites, ensuring the lasting peace. The sword used there is a machaera. On the Samnite side, the largest Oscan nation was a league composed of four tribes, The Pentri, Hiprini, Caudini and Carricini, living in the central Italic mountain range called the Appenines. There were few large cities (but perhaps Bovianum, Aufidena, Maluentum, Aquilonia, Caudium, Cluviae and Teanum Sidicinum) and due to isolation less Greek influence, which explains the local style of warfare. No heavy hoplite phalanx here, but a light, agile infantry relying on skirmishing and ambushes. Even the tactical style of the Samnites was famously imitated by the Romans. The most humiliating defeat they suffered indeed was at the hands of a Samnite host at the Furculae Caudinae in 321 BC, a bloodless ambush near Capua, so hopeless that the 40 000 Romans led by two consuls immediately surrendered. This showed the Samnites well-suited to a difficult terrain they knew perfectly. But when engaged in a regular pitch-battle on flat ground like during the third Samnite war, they were utterly defeated. Their organization relied on the old tribal system of the pagus. Each "touto" contained a number of "pagi", based on what villages can muster. On Samnite warfare however, historians had to deal with confusing material, from Livy and Dionysius. While Oscan warriors are profusely illustrated, and it appeared the Samnites were lightly armed, with reduced, thin bronze body protections and bearing a smaller scutum. Heavier troops used smaller version apparently of the Argive round shield. Common helmets were the Montefortino and Italo-Attic style, adorned with many feathers. Outside the light tragula, or javelin, they had curved swords (of the "machaera" type) and light spears. So the Ensiferi Samniti was probably given a relatively long Machaera (latin for Makhaira), a scutum and three-four javelins. Probably they were also bare-foot. The lighter Ferentarii, probably younger, were given even smaller shields, no protection, more javelins and a dagger rather than a sword they could not afford at that stage. Peasant militias were probably also armed only with light spears and summary shields. Part of these Ensiferi could have been also nobles on foot recruited among the famous Legio Linteata, with linen clothes and silver body armour, richly adorned. The Umbrian ensiferi were a reflection of the different nature of the region, with still strong italic influences from the nearby Oscan and Sabines, but also the Greek culture proper to their city-states, generating an aristocratic rather on horseback, with a strong core of hoplite while the larger part of the army was made of lighter infantry, the heaviest and richest part among the commoners being the Ensiferi using a long sword, either Spatha or Machaera and heavy javelins of the pila type. Armour protection was derived from the Villanovian panoply, while the helmets were the usual Negau, Italo-Attic and Chalcidian types, some heavily decorated probably used by the nobility, and also with the usual crests, plumes and feathers to better effect. The amount of daggers recovered suggest the light infantry, either Iaculatore and lancearii used these as secondary weapons. The Lucanian were of Oscan culture and shared the language and also warfare in large part. They conquered and held for long (until their submission in 270 BC) the southern Italian "boot", except for Greek coastal cities. Lucanian warriors are well known by numerous vase artworks, and due to the nature of the cities, rather small, Lucanian nobles fought on horseback while there were few hoplites, if any, the bulk of the infantry being made of lighter lancearii and ferentarii while those that can afford better armour protection and equipments like the Machaera were the Ensiferi. They were characterized by the large use of the Italo-Attic type helmet, light bronze body armour, and broad leather belts covered with bronze scales and hooks. 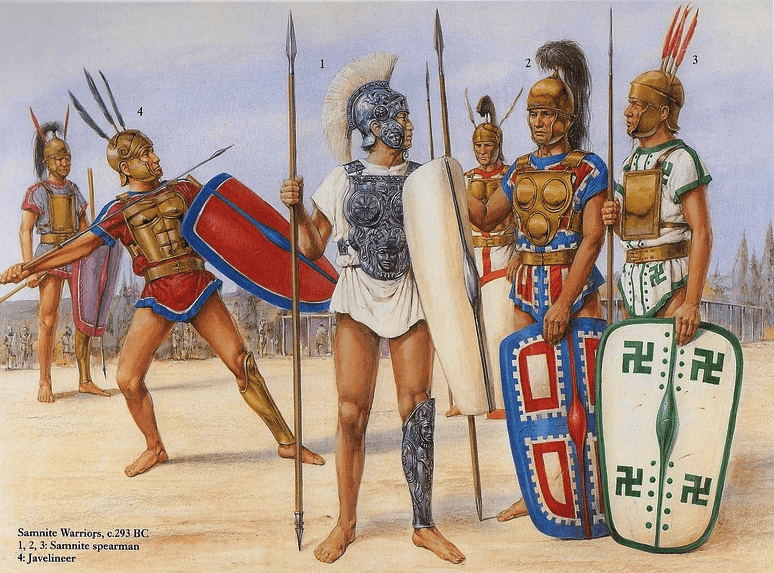 These Ensiferi were likely to have a round shield rather than the lighter, smaller scutum used by light infantry, and greaves so they can be basically resumed as sword hoplites, a bit like the Peloponnesian war era Ekdromoi Hoplites.